Belton. "Ze Ma Janana." Recorded 1967. Lorraine Sakata. Mahali style. © Radio-Television Afghanistan Archives. Dupree, Nancy. A Site between Bazarak and Rokha: A75-73. 1975. Dupree Collection, Williams Afghan Media Project, Williams College, Williamstown, MA. Mottl, Dmitry A. 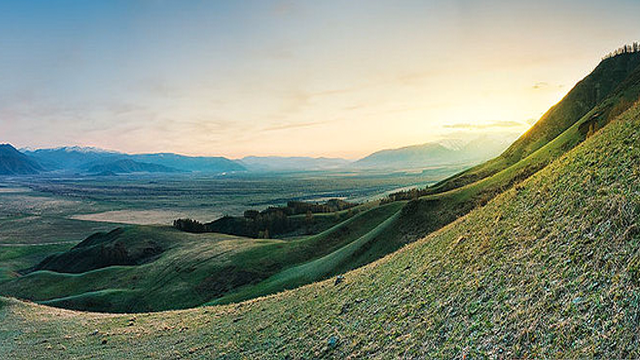 "Уймонская степь (Uymon Steppe, Altay)." Digital image. Wikipedia Commons. Accessed August 11, 2010. http://tinyurl.com/3853zxl. Rex. "Steppe of Western Kazakhstan in the Early Spring." Digital image. Wikipedia Commons. Accessed August 11, 2010. http://en.wikipedia.org/wiki/File:Steppe_of_western_Kazakhstan_in_the_early_spring.jpg. UNAMA/Taqi Mihran. "Peace Day Calligraphy: 16 September 2009." Digital image. United Nations Assistance Mission in Afghanistan's Flickr Photostream. Accessed August 11, 2010. http://www.flickr.com/photos/unama/3924593163/. History has brought many different cultures and peoples to the lands of today’s Afghanistan, many of which had a lasting impact. The first of these were the Indo-Iranians. Afghanistan has been invaded from the North for much of its history. Around 2000 BC was the first important such invasion from a group known as the Indo-Iranians. These are people that seem to have come off the steppe and they’re moving into Afghanistan and through Afghanistan down into India and also moving down towards the Iranian plateau. They’re cattle-keeping people. They have carts. They have chariots. They have horses. And you know culturally it marks the introduction of new sets of languages. These people would have a dramatic effect on the religion of Afghanistan, and on the culture, on the language. Afghanistan’s main language today, Dari, is part of the Indo-Iranian language group. The Indo-Iranians swept down from the North and sacked South Asia. This set the pattern for a cycle of invasions that will come to define Afghan history.